Shadow Planes Pocket Worlds is an epic fantasy supplement for the Pathfinder Roleplaying Game written by Dan Voyce, Jarrod Camiré, Sarah Hood, Chad Middleton, Umber Phillips, John Pope, Burt Smith, Brian Suskind, and George “Loki” Williams and published by Kobold Press. 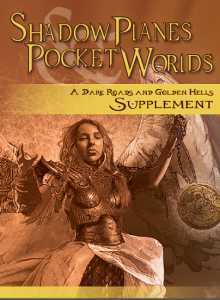 This supplement to the wildly popular Dark Roads and Golden Hells takes the sometimes confusing and completely amorphous concept of the planes in RPGs and provides more interesting and exciting planes and monsters to encounter while taking a wild planar journey. Kobold Press has hit a real home run with their view of the planes and how they operate. Shadow Planes Pocket Worlds feels like a solid supplement rather than something that was just tacked on because there was extra material just lying around. Even without the benefit of Dark Roads and Golden Hells, this book still works well as a standalone, product for extra-planar information. Shadow Planes Pocket Worlds is 25 pages long with 21 pages of content including 6 new planar diseases, 7 new drugs and poisons, 7 planar effects, information for a trap, 12 magic items a bestiary and two well fleshed out locations. Kobold Press set the (Wolfgang) Baur high on Dark Roads and Golden Hells and has maintained their standard of excellence with this supplement. If you are planning on running a game that involves planar travel then this series is for you. This supplement does not go as far as its predecessor to explain how the planes work, but that isn’t the purpose. The two new locations alone make this a product worth buying; add in the rest of the crunchy information makes Shadow Planes Pocket Worlds even more appetizing. The cover is branded correctly, complementing its older sibling very well. The layout of this book is spot on, rather than trying to fix what wasn’t broken, the folks at Kobold Press stuck with a winner. The page borders still look great and they are just what the Dr. ordered for a product dealing with the planes. The interior art is well done in black and white; there were a few “white spaces” that would have been great for art, but that is minor. The fonts are the right size and easy to read, this book looks great! The diseases and poisons were handled well. Rather than just a charted entry for each poison, there is a brief description, not just a collection of numbers. The templates are reasonable and don’t feel overpowered. Putting a template to an imaginary friend was innovative, but I should realize that Kobold Press has shown a willingness to go there and make it work when they get there. The magic items were interesting, without adding additional burdens to the GM or the player. If you are not running a game that involves the planes, then this product loses some value. Even a product as well thought out and as well presented as this one diminishes if not used in the context for which it was intended. If you are even hinting at any type of extra planar activity in your game, then there is something here you can use. The poisons and diseases lose a bit of their flavor in the same way the entire product does if not handled correctly. This is a tight, tight product! The layout and editing are spot on; the content is top notch. There was a little too much white space on a few pages that could have been filled with art or even designer notes or suggestions on how to run a better planar game. For many of you, this might seem like I’m asking for and expecting way too much, but when you do things as well as Kobold Press does, expecting more is the only way they will maintain their high standards or strive to top themselves. This is a product that should spend no time in the shadows or be kept in anyone’s back pocket.